Arrive to Cape Town, where you are met and escorted to your hotel. Enjoy one last morning game drive in Masai Mara before returning to Nairobi by air where a day room is provided. 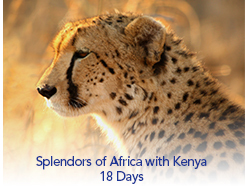 Time permitting, you have the option of visiting the Karen Blixen Museum and Giraffe Centre (additional cost). Transfer to the airport for your departure flight.